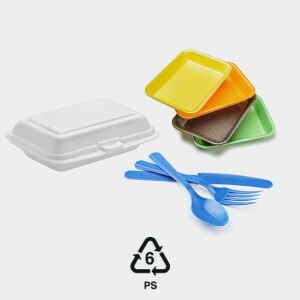 There are different types of plastic #6. One type, foam, IS NOT accepted in your curbside recycling cart. Electronics Recycling Events in San Joaquin County hosted by Onsite Electronics accept and recycle block foam. Packaging peanuts are not accepted. Upcoming Electronics Recycling Events are listed on the E-Waste page. Dart Container Corporation at 1400 E. Victor Road in Lodi accepts clean food and transporation foam for recycling. Drop-off is free and open to the public. If you are unable to take the foam to a facility for recycling, please throw it away in the trash.